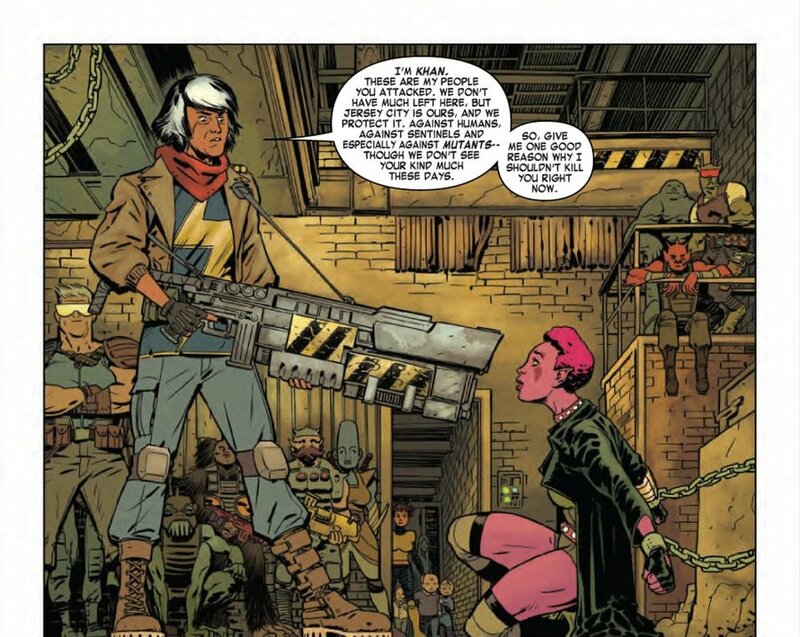 Marvel’s Exiles #1, written by Saladin Ahmed and art by Javier Rodriguez and Jordie Bellaire, is a more-or-less follow up to the Exiles run from 2001. It has a similar set up but with new, interesting versions of current characters and some surprise return characters. This pilot issue seems to be holding some of its story beats close to it chest, resulting in a somewhat uneven pace. The comic begins on the moon with a character named the Unseen. For the unfamiliar, the Unseen is in fact Nick Fury who the Watchers have exiled, punishment from a previous event called Original Sin, to the moon, tasked to observe the events on earth but never interfere. Nick Fury’s role in the Marvel universe has taken a significant shift from Bond-esque spy, to cosmic deity. His dialogue is enjoyably robust and gothic, reminiscent of old school Stan Lee. The Unseen’s thoughts are interrupted by the Tallus, a device featured in the previous run of the Exiles that facilitates the team’s travel between dimensions. The Tallus seems to be operating of its own will and departs the moon to seek out a new Exiles team to save the mulitverses from an evil force. 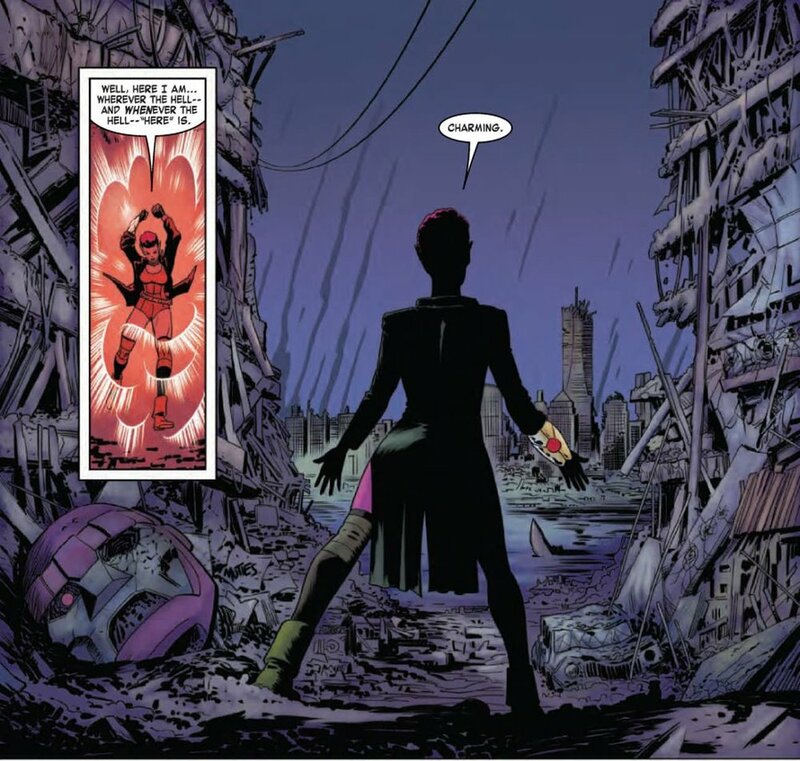 This leads to the finding of Exiles veteran Blink, a teleporting mutant (featured prominently in the FOX television series, The Gifted). From there, Blink is forcibly teleported from multiverse to multiverse recruiting a gruff, post-apocalyptic version of Kamala Khan and Iron Lad, the young version of Kang the Conqueror. Exiles does a good job in presenting the main characters, Blink is fun with a bit of no-nonsense, her conversation with the Unseen is particularly entertaining. Kamala is very different from her 616 counterpart. Her world seems to be embroiled in a battle against mutants and she is the gruff, badass, leader of a rebel faction. There’s not much to say about Iron Lad’s personality as of yet, he’s a bullied teenager with a newly acquired Ironman suit.. His back-story is relatively complicated but this comic does a good job explaining it. The main problem with this issue is the pacing. The comic is front-loaded with the Unseen talking to himself and introducing Blink. Once the adventure starts it rushes past Kamala and Iron Lad’s timelines before they’re “destroyed” by this unknown evil. Most likely, as the comic progresses, it will double back and shed light on the story of the characters’ past. Its not clear to where the Unseen fits in this story, narratively; thematically, Nick Fury was exiled to the moon by the Watchers, maybe he’ll become an unofficial member of the team. The art, with penciling by Javier Rodriguez and colors by Jordie Bellaire, is decent enough. It gives the impression that this will probably be a more fun adventurous series, as the colors are bright and solid with not many shadows also characters’ faces are more animated and expressive. The back grounds are nicely detailed making the different timelines almost tangible. The most distinct aspect about the art is when the timelines are destroyed; the panels start to tilt and disappear into the page. Hopefully the art team continues to play with the page structure and make this comic stand out more.